A couple of days ago, I ended my post with a picture of Jamie and I getting ready to start out on a Sunday night adventure while in Saint Augustine which is the nation's oldest city. Now I suppose that it would go to follow that the nation's oldest city might also be the nation's most haunted city so with that in mind, I checked out the myriad of ghost tours that were available and decided on one that actually conducts the tour via transportation in a 1977 Cadillac hearse. 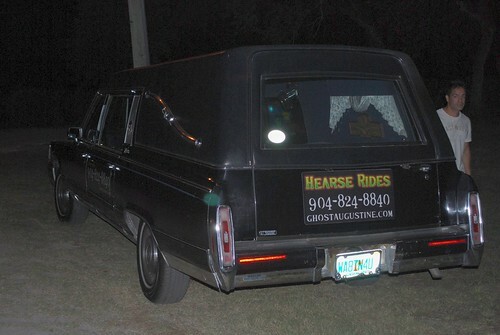 The tour is offered by GhoST Augustine and even if there were no ghosties to be found, it seemed like it would be a pretty cool thing to do even though I knew Amanda was going to be upset that she missed the chance to ride in a hearse. It definitely gave Jamie some bragging rights! 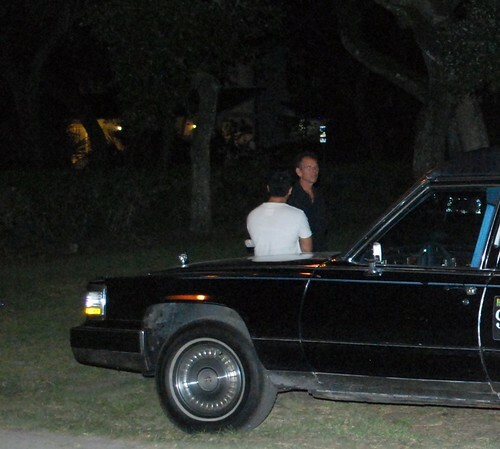 At 9:00 p.m. we met up with Bill, our driver who originally hailed from Massachusetts, and a young couple who were staying at the Saint Francis Inn Bed & Breakfast which has been in operation as an inn since 1791 and is supposed to be one of the more haunted inns in Saint Augustine. The couple that we were with were raving about it so much so that I've been thinking if I ever go back down that way, that may be the place to stay! It would certainly beat the heck out of the nasty Quality Inn that Jamie and I were staying in! But alas I digress ... back to the tour! 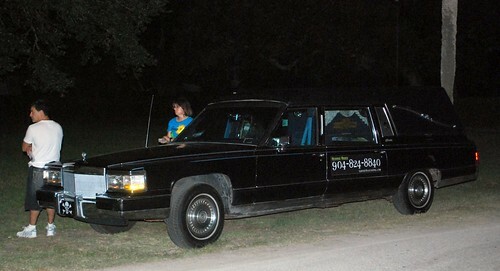 After the four of us had piled into the back of the hearse, Bill explained that even though it was a ghost tour he liked to emphasize the historical aspects of the city and I knew right then and there that I was certainly going to enjoy the evening as Bill was speaking my language! The first stop on our evening's journey was The Kenwood Inn which was built as an inn back in 1865 in the Queen Anne Victorian architecture style - it also looks like it would be a lovely place to stay especially with that beautiful second floor porch! 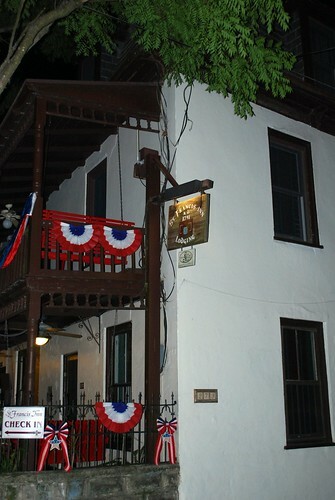 According to Bill, the inn is haunted by a young lady who had been a mistress of a local doctor before he had her killed; her spirit still lingers at the inn along with the spirit of a gentleman who also owned the inn at one point and who just likes to make sure that the current guests are well taken care of. As part of our tour, Bill had handed each of us an EMF meter when we arrived at our first stop. For those not familiar with them, an EMF meter is an electromagnetic frequency meter which is a tool used by all the cool ghost hunters! The theory is that spirits put out EMF and these meters will help you to detect when there is some sort of paranormal activity present in the area. Anyone who has ever watched Ghost Hunters or Ghost Adventurers or any of those shows are most likely very familiar with the equipment. I had actually used one once before when Amanda, Darci, and I did our ghost tour in Gettysburg last year but this was Jamie's first time with one. As we stood outside the wooden gate at The Kenwood Inn and Bill told us the story of the murdered mistress he added that he wasn't sure how accurate the story was as it was one that had been handed down through the ages and for all he knew, it could be completely different and she wasn't really murdered. As soon as he said that, all four of our EMF meters briefly went crazy with flashing lights even though there had not been a single indication of any EMF prior to Bill's statement. I guess the murdered mistress didn't like him disparaging or doubting her history! From The Kenwood Inn we proceeded down the road to the place where our companions were staying - the Saint Francis Inn. There's a small park across the street from the inn where we spent a few moments with our EMF meters and just walking through the park and getting a feel for the place. 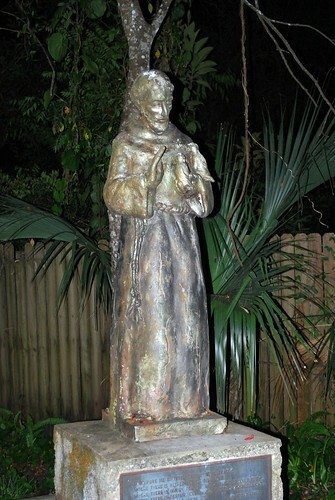 This statute of Saint Francis stands near the water fountain that has been there for years and years but it was hard to see too much of anything being that it was almost pitch black! 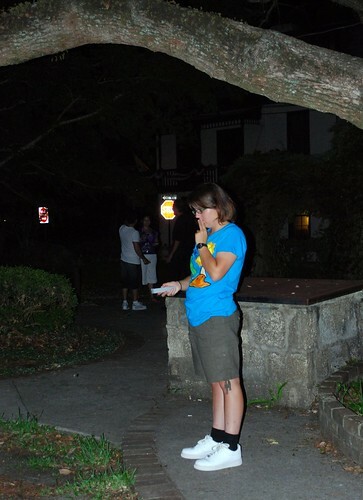 As everyone else went across the street to check out the Saint Francis Inn itself, Jamie took a couple of moments to check out her EMF meter in the park. Bill had told us that there was a large underground electrical cable in the area that might give us some "false readings" and that could be what she was looking at here. Well, either that or she was just waiting for me to catch up! We sat outside the Saint Francis Inn on a low wall across the street while Bill told us the sad story of Miss Lily and the man whom she loved but it was a love that society forbade being that she was black and he was white. Her lover was sent off to serve in the Civil War and never returned and Miss Lily haunts the inn to this day. Our companions were actually staying in Miss Lily's room and were hoping for some sort of ghostly encounter later that night but even if they didn't get one I don't think they would have complained as they said the old inn was a wonderful place to stay with fantastic food and in-room cognac, too. Definitely sounds like a place I'd like to check into one of these days! Before continuing, I should mention that my Nikon is not the best camera to be using when on a ghost tour as it's very difficult to take low-light pictures with it. Ideally when taking night shots my camera should be on a tripod and used without flash as when using a flash, it has a hard time focusing. Point-and-shoot cameras are much more suited for this sort of thing but alas, the battery in Jamie's camera was dead and her step-mom had accidentally sent along the wrong charger so we had to make do with my camera so consequently the pictures are not as clear as I would have liked due to some camera shake on my part. Leaving the Saint Francis behind, we climbed back into our hearse and drove over to our next stop - the Saint Augustine National Cemetery. 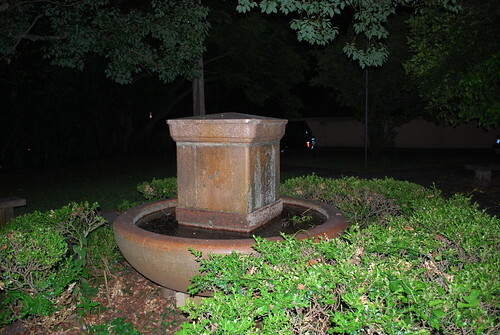 This cemetery is the smallest national cemetery in the country and is adjacent to what is now the Florida National Guard Headquarters on the grounds of what was once a Franciscan monastery. 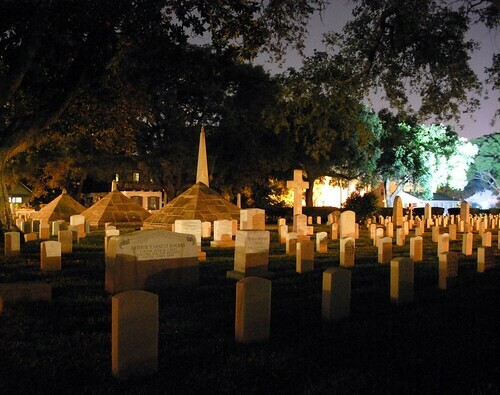 The Saint Augustine Burial Ground was not designated as a national cemetery until 1881 though the first interment took place in 1828. Most early burials were soldiers who died during the seven-year long “Indian War” either in battle or due to sickness and disease which was pretty common in Florida's subtropical climate. "On Dec. 23, 1835, Maj. Francis L. Dade and his company were ordered to reinforce Gen. Wiley Thompson’s troops stationed at Fort King, Ocala. During the trek from Tampa to Fort King, Dade became lost and announced to his men that they had successfully passed through Seminole-controlled territory. As a result, he failed to take appropriate precautions. The heavy winter garments of the soldiers covered their weapons, so that when the Seminoles staged an attack, Dade's troops were virtually wiped out—only one soldier purportedly survived. A few months later, when travel in the area was again possible, the massacred soldiers were buried at the site. In 1842 when hostilities ceased, the Army proposed to transfer the remains of all who died in the territory, including those who fell with Dade, to a single burial ground. Reinterment took place at the St. Augustine Post Cemetery. In addition to Dade's command, more than 1,400 soldiers were interred in three collective graves. 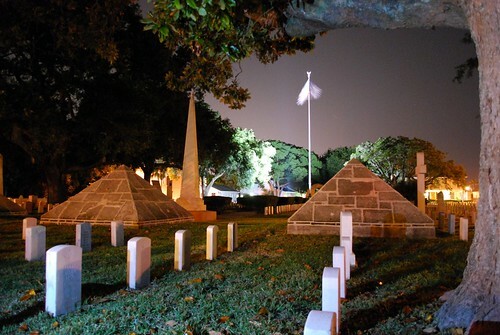 Three distinctive pyramids constructed of native coquina stone were erected in their memory, as well as several nearby plain white markers to designate the graves of Seminole Indian scouts." "The three distinct pyramids are constructed of native coquina stone which were erected in 1842 and were originally covered with white stucco. The memorials were dedicated at a ceremony on Aug. 14, 1842, that marked the end of the Florida Indian Wars. 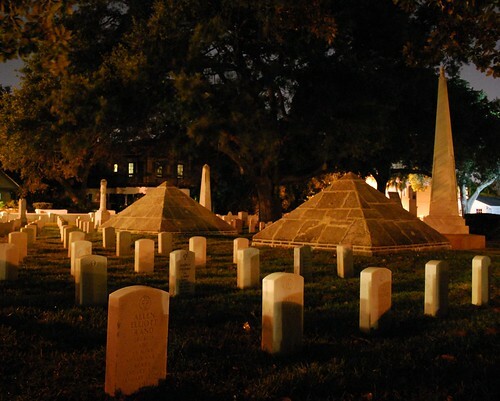 The pyramids cover vaults that contain the remains of 1,468 soldiers who died during the Florida Indian Wars, from 1835 to 1842. The Dade Monument, a coquina stone and marble obelisk, was erected in 1881 and commemorates Maj. Francis L. Dade and the men who died with him at the 1835 massacre. 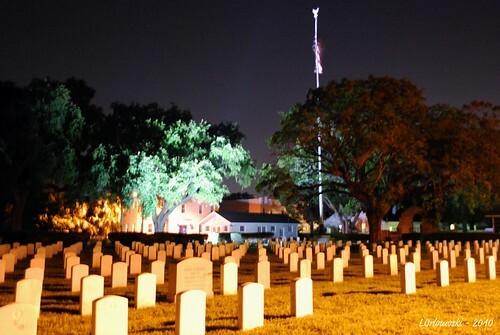 Soldiers stationed at the St. Augustine post contributed one day’s pay to fund the memorial." 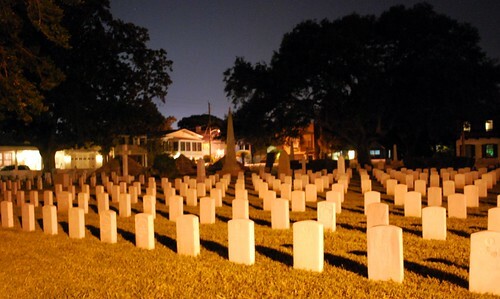 The cemetery was expanded to its current 1.36 acres in 1912 and in 1970, Saint Augustine National Cemetery was included in a National Historic Landmark historic district that encompasses the oldest part of the city. All in all it was neither creepy or scary but very reverent as it should be. Just down the road from the Saint Augustine National Cemetery is the site of Saint Augustine's most famous murder that occurred in 1974 when 56-year-old Athalia Ponsell Lindsley was hacked to death with a machete on her front lawn. The story is very similar to that of the O.J. Simpson case and there was even a book, Bloody Sunset in St. Augustine, that was written about it. I have to remember to see if the library can order it for me so I can read more about it. It was rather hard to believe that such a brutal murder could occur in such a peaceful neighborhood but obviously one did. 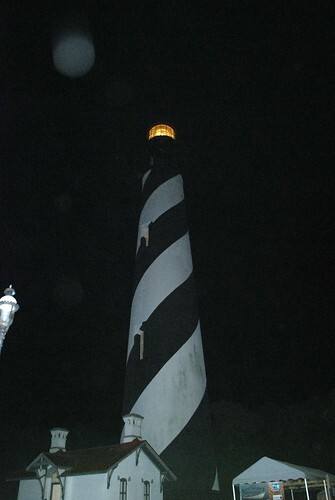 Built in 1874 to replace the original lighthouse that was lost due to erosion, the Saint Augustine Lighthouse is reported to be haunted by quite a few spirits including the spirits of several children that were killed during a tragic accident while the lighthouse was under construction as well as a former lighthouse keeper and a disgruntled neighbor. The team from TAPS (i.e, Ghost Hunters) visited the lighthouse in 2006 and then again in 2008 and it also received a visit from Ghost Hunters International in 2009. Not having seen any of the episodes I'm not sure what they did or didn't find but Bill told us that it most definitely stirred up interest in the lighthouse. We all got some rather interesting readings on our EMF meters from time to time but I wasn't paying a whole lot of attention to that as I was too busy trying to get a decent night shot that wasn't completely and totally out of focus or blurry from shake! I kept wishing I had my tripod with me at the hotel as I would most definitely have made the drive back out after the tour to try to take some decent pictures but alas, I hadn't brought it with me on the trip. Next time! 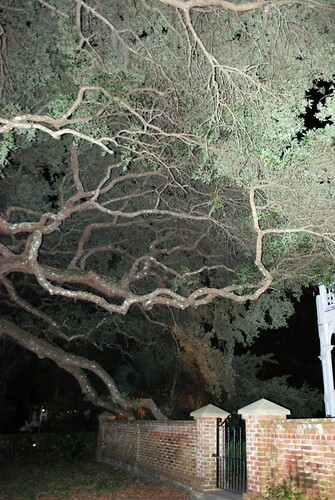 My camera was good for taking pictures of the creepy looking trees that grow near the lighthouse, though! While hanging out by the hearse and talking to Bill before we left the lighthouse, I found out that one of our companions had lost a cousin in the September 11th attack on the World Trade Towers when he stayed behind to help out a co-worker who was in a wheelchair. He said that was one of the reasons that he really believes in spirits as he felt his cousin, whom he was very close to, was still with him. Seems to me that's as good a reason as any to believe in the paranormal especially if it brings him a certain measure of comfort. Finally it was time to climb back in to return to Saint Augustine proper and call it a night. All in all I think it was a wonderful tour even though I think Jamie might have liked to actually encounter a ghost or two. Either way though we both agreed that it was so much better than the Ripley's Museum and that Bill had been a wonderful tour guide. I tell ya, that's the kind of job I need to get one of these days- spouting history while looking for ghosts! It would definitely be right up my alley! 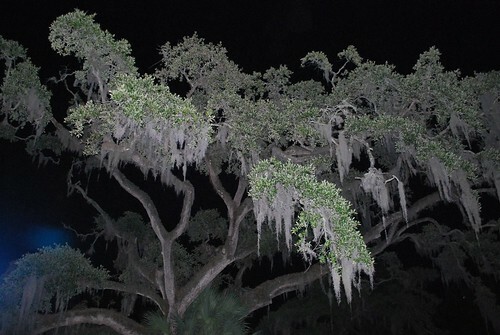 Wrapping up the night I stopped long enough on our way back to our crappy hotel to take a picture of some of the Spanish moss that looked even creepier at night than it does during the day. I liked it so much better at night, though, as it was finally cool enough to stand outside without breaking a sweat and not be surrounded by tourists! 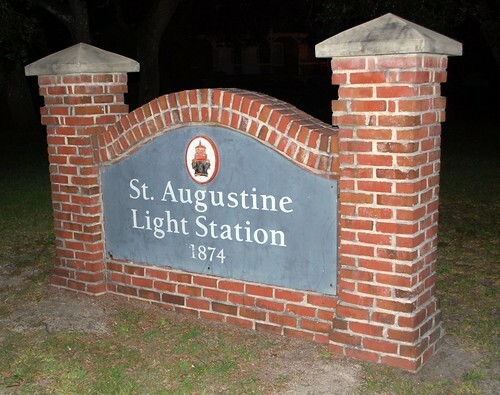 I must say I rather liked Saint Augustine at night! Next post we continue our way south for the best gravy south of the Mason-Dixon Line but not before meeting another Georgia Peach! 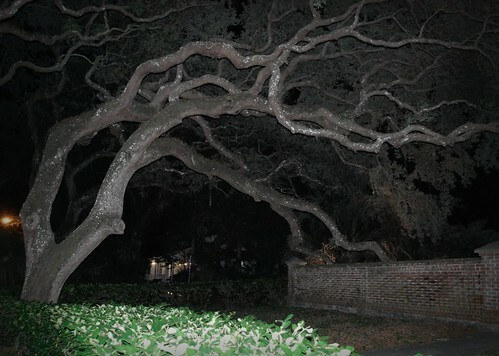 Those creepy trees are Live Oaks and are one of my favorite trees! They grow 'em big here in the Deep South, and it's actually the state tree of GA. I think they are magnificent! Majestic and graceful, although at night in a graveyard I can see how you'd think they look creepy! You need to spend more time in St. Augustine! It's such a wonderful city. 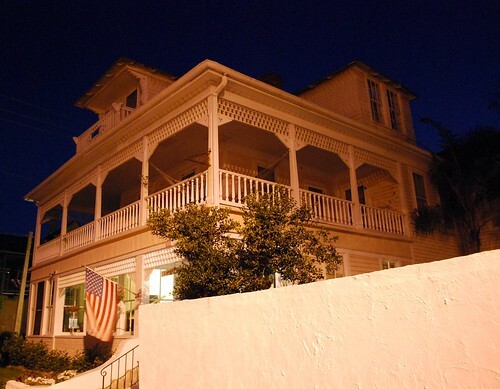 When I've visited St. Augustine I have always stayed in B&Bs, which I absolutely love! My parents stayed in a Hampton Inn right on the Inter-coastal Waterway for their 50th anniversary a few years ago and they said it was wonderful. So there are many options other than your crappy hotel! 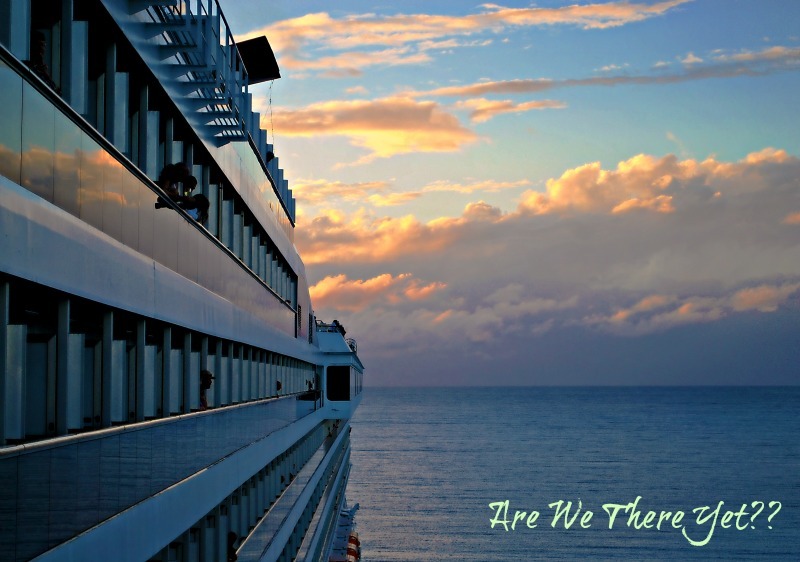 Looking forward to the next leg of your adventure! love the history lesson! as many times as i have been there i learned a lot today! barb and i have different opinions of this city! ha ha ha but i do think it is worth seeing for sure. hurry south! I so much loved this post. 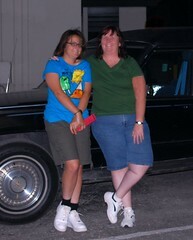 Back when we lived in Arizona, I took the ghost tour of Tombstone and had a really good time. I loved all of the pics and your detail in the tour. Even though you didn't have the right camera--the pics were really great too. That looks a fab tour. I can see Amanda being jealous over missing that. I think those shots of those magnificent oaks are fantastic! The moss is another color than the leaves, and the coloration of the limbs is different,still. I'm really captured by the oaks and those branches. Cool!!! See what you can do with your camera even though it wasn't the proper setting? Those are the spookiest pictures I have EVER seen. And award-winning. I felt like I was there in the cemetery. The first shot of the tombstones nearly took my breath away. WHOA. 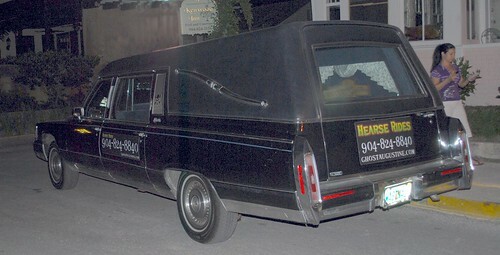 I would not ride in that hearse! !